We love to photograph Vancouver Indian weddings! The vibrant colors, the meaningful traditions, and the real emotion are all personally and photographically inspiring. Color is such a significant part of South Asian weddings, and the red attire of the bride has significant symbolic meaning. For this bridal portrait taken at the Shangri-La Hotel in Vancouver, Canada, we wanted the emphasis to be on the bride's striking eyes. The diagonal line of the jeweled border of her red lengha / lehenga keeps the focus on her face while the use of a reflector accentuated the catchlights in her eyes from the window light. Instead of incorporating the decor of the room, we hung a piece of her red lengha behind the bride, continuing the red and white color scheme. This decision and the use of the Canon 85 1.2 to create the creamy bokeh background simplified the composition to direct all attention to the symmetry and beauty of the bride's face. 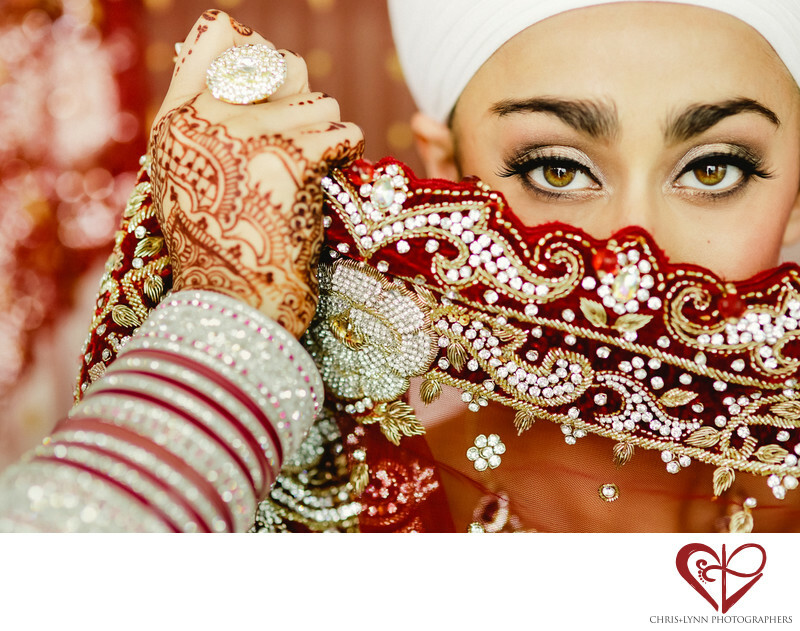 This image was one of many images from this Vancouver Sikh couple's South Asian wedding featured on the popular Junebug Weddings blog. We were also fortunate to photograph this couple's London, England engagement photo session, which was also featured on the Junebug Weddings blog. Location: 1128 W Georgia St, Vancouver, BC V6E 0A8, Canada. 1/400; f/2.0; ISO 800; 85.0 mm.